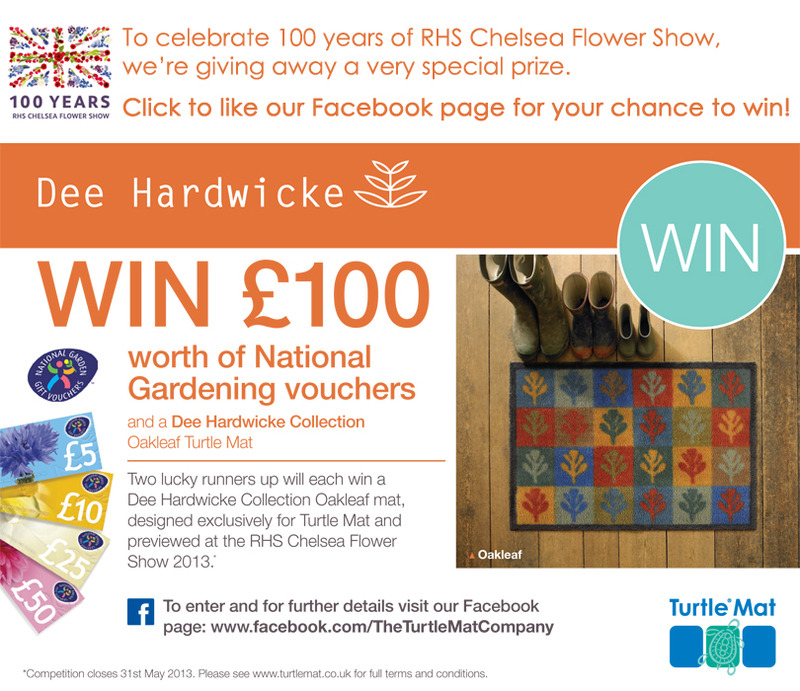 Celebrating 100 years of the RHS Chelsea Flower Show - WIN £100 of National Gardening Vouchers - The Turtle Mat Blog - For news, features and competitions! The Turtle Mat Blog – For news, features and competitions! Rebecca Wilson on the subject of Competition,In The Garden,RHS Chelsea Flower Show 2013. Posted on May 18th, 2013. If you are the lucky winner or one of the two runner-ups of the competition, we will contact you via the email address accompanying your competition entry (supplied via a Turtle Mat Facebook application) and ask for your full name and address in order to send you your prize. Only the Turtle Mat Company Ltd. and companies working for the Turtle Mat Company Ltd. have access to your personal details and we do not share them with anybody else for their marketing purposes, without your permission to do so. The competition closes at midnight on Friday, 31st May 2013. The prize winner and runner-up winners will be notified by The Turtle Mat Company Ltd. by Friday, 14th June 2013, at the email address supplied when entering the competition (see above). Entries must be submitted by completing all elements of the Turtle Mat Chelsea Flower Show 2013 entry form via the Turtle Mat application on Facebook. Entries submitted by any other method will not be accepted. Unless otherwise stated, competitions are only open to UK residents over the age of 18 at the closing date. The Turtle Mat Company Ltd. reserves the right to request proof of age. Your answer to the competition question must be your own work and its originality will be taken into account by the judges. By entering this competition you agree to grant The Turtle Mat Company Ltd. the right to publish and use your entry in all media for all purposes in connection with the competition. The competition winner will be contacted personally. In the event of their being no reply from the contact details (email address) supplied by the winning entrant The Turtle Mat Company Ltd. reserves the right to offer the prize to a runner up or withhold it for use in another competition. The prizes – first prize of £100 National Gardening Voucher and one 60x85cm Dee Hardwicke Oakleaf Turtle Mat and two runner up prizes of one each 60x85cm Dee Hardwicke Oakleaf Turtle Mat – must be taken as stated and cannot be deferred. There will be no cash alternatives. This entry was posted on Saturday, May 18th, 2013 at 8:45 am; on the subject of Competition, In The Garden, RHS Chelsea Flower Show 2013.